"This is a basic fruit muffin recipe. 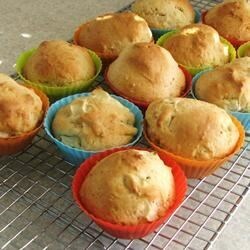 I use chopped apples, but 1 cup of any type fruit may be added to make a quick and easy batch of fruit muffins." In a separate bowl, cream together sugar and shortening. Stir the flour mixture into the sugar mixture alternately with the milk. Fold in the fruit. Pour batter into prepared muffin pans. A dozen muffins bursting with flavors of fresh raspberries and tangy lemon. I made it with half whole wheat flour, half brown sugar, and added some ground cinnamon and cloves, and they were really tasty! I also left the skins on the apples. This is a good base recipe. Made as is, it is pretty bland. Just add some spices and more fruit (and maybe sugar) and then it's yummy. I make these all the time and with any kind of fruit I currently have, and everytime they have been delicious!